UK Government Minister Lord Ian Duncan on a visit to Hunters of Kinross butchers, Kinross, Perth & Kinross…Lord Duncan pictured with Ian & Pamela Hunter, Lisa MacInnes from Save A Life For Scotland, Luke Graham MP and Douglas Scott Chief Executive Scottish Craft Butchers and the staff at Hunters of Kinross with the ‘Difibrilator’ outside Hunters of Kinross shop. UK Government Minister Lord Duncan joined the team of staff in a Kinross butchers shop this week to congratulate them on leading the way on a national initiative to raise money for community defibrillators. 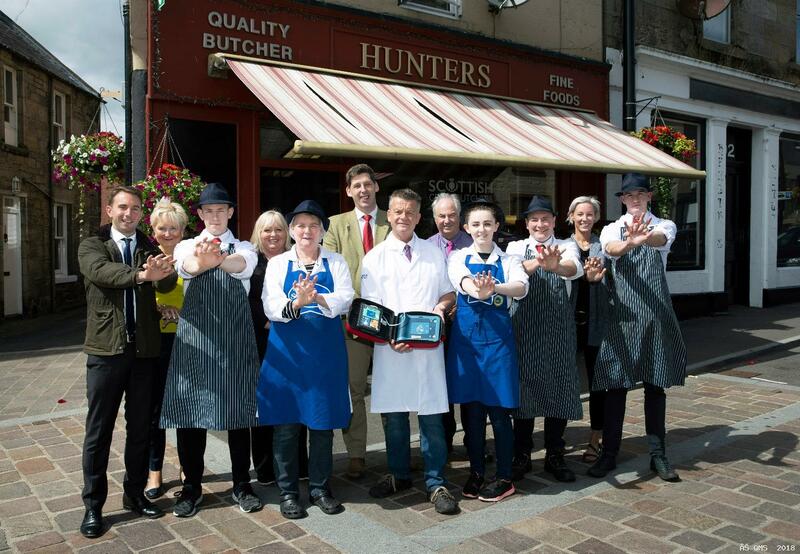 The idea behind the “Butchers at the Heart of the Community” initiative, supported by Scottish Craft Butchers, the Scotch Butchers Club and Save a Life Scotland, was started by butcher Pamela Hunter who runs Hunters of Kinross with her husband Iain. Luke Graham, MP for Ochil and South Perthshire, joined Lord Duncan to hear about the aim of the initiative to help and encourage people living in communities throughout Scotland to be ready and confident in delivering CPR (cardio pulmonary resuscitation) for someone who has suffered a cardiac arrest. In December 2016, a regular and popular customer of Hunters picked up his order and headed off to celebrate the new year. He never returned to the shop after suffering a cardiac arrest and it was his wife who told the team at Hunters, the awful news. 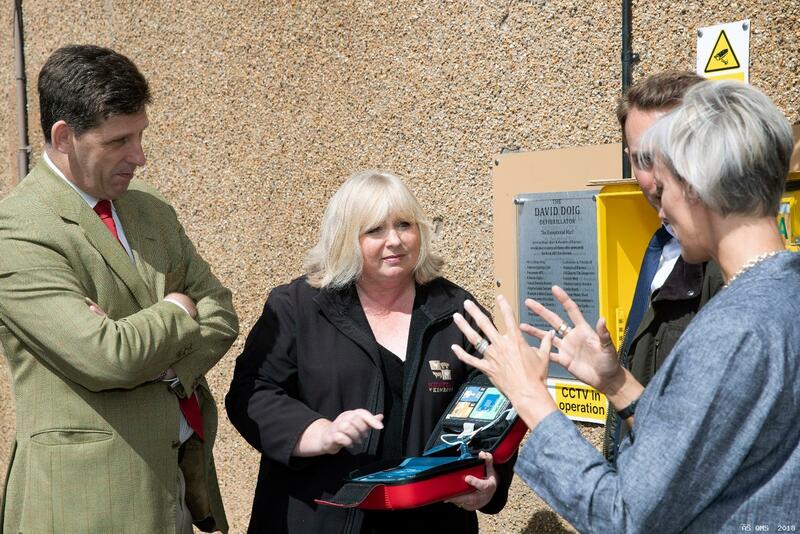 Since then, Pamela has worked tirelessly in her community, running raffles and special events to raise funds to buy a 24 hour public accessible defibrillator, which is now located outside their shop. Following the success of the fund-raising project by Hunters of Kinross, the initiative is now being rolled out across Scotland. 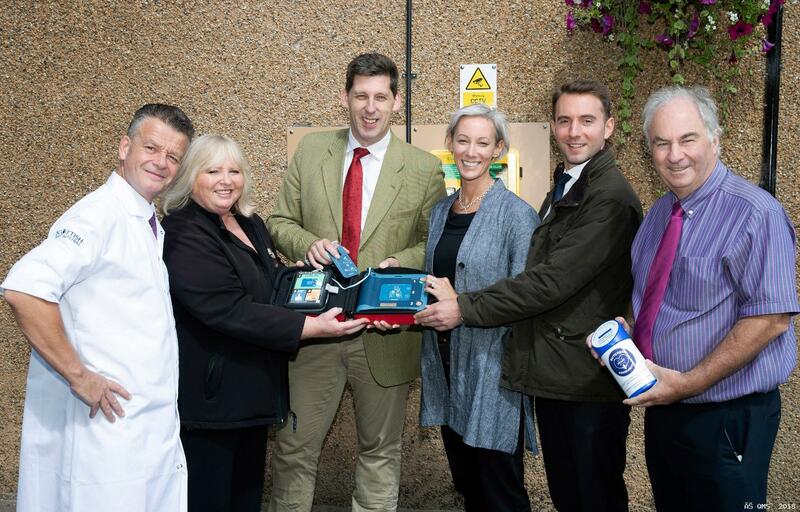 The Scottish Craft Butchers and The Scotch Butchers Club, run by Quality Meat Scotland (QMS), who collectively have a network of over 400 butcher members, have partnered with Save a Life Scotland to encourage members to take part and help save lives in their local community. Butchers across Scotland are now being encouraged to pledge “I’m In” and display collection tins in their shop to raise money for a local defibrillator to support the Butcher’s at the Heart of the Community campaign. Over 30 Scottish Butchers have so far have signed up to the campaign. Save a Life for Scotland partners are available to support locally with CPR and defibrillation training. The project is not only about providing a defibrillator to communities, but training for both staff and customers on how to use them and deliver CPR. Butchers interested in getting involved should contact Save a Life Scotland by emailing hello@savealife.scot. Collection tins are being supplied by Scottish Craft Butchers and the Scotch Butchers Club. 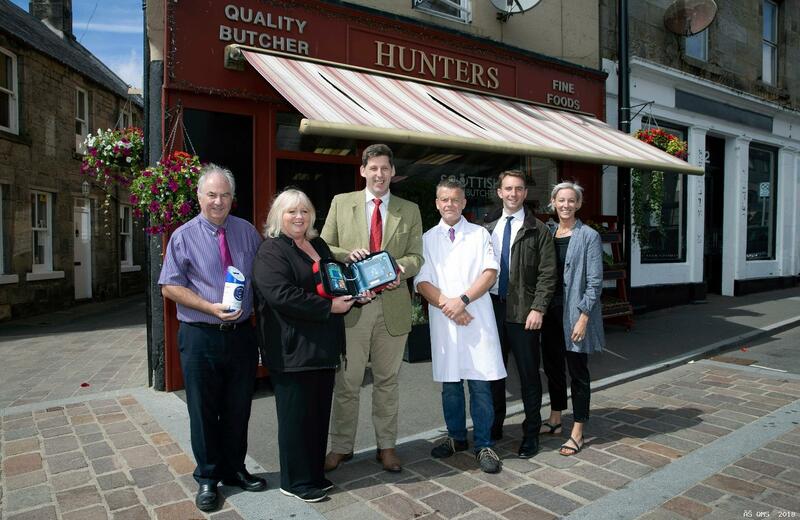 After losing a good friend and customer, Pamela Hunter of Hunters of Kinross Butchers felt that as a small business they needed to do something for their community. 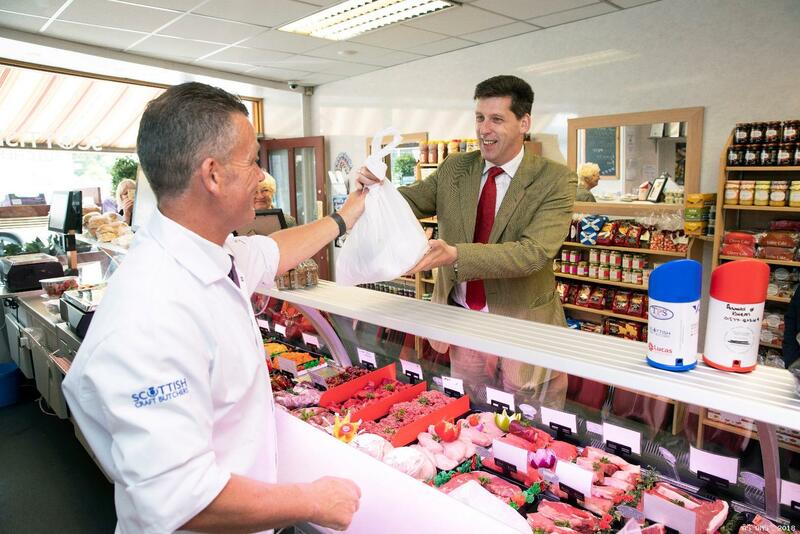 “We are delighted with the response from butchers around the country to the initiative and to have the support of Lord Duncan and Luke Graham is fantastic. “Cardiac arrest in Scotland is much more common than we first thought. There is an average of 70 out-of-hospital cardiac arrest each week and on average only four people survive. We wanted to help do something about this,” she said. Douglas Scott, Chief Executive of Scottish Craft Butchers said: “This project is all about enabling butchers to save the lives of people in their community. Raising money to provide defibrillators and training staff on how to do CPR,” he said. Lisa MacInnes, Director of the Save a Life Scotland campaign said: “Someone who is having a cardiac arrest needs immediate help, you cannot make the situation worse for them and so saving lives from cardiac arrest really does begin in the community.